LondonJazz: What first drew you to Dowland? Was there a particular moment in your life? Christian Muthspiel: My father directed a choir and had a major interest in early music; so the composers of the Renaissance - French, Dutch, Italian, and English too - were always around. I heard Dowland virtually from birth on. So you could call this music part of the 'sountrack of my childhood'. 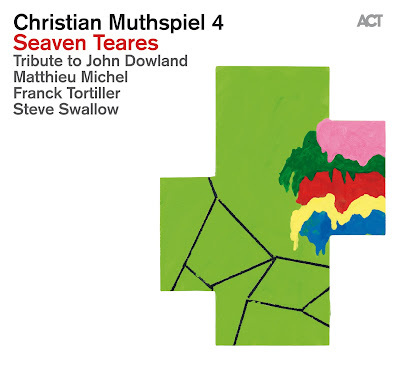 LJ: You've taken Dowland's Seaven Teares as the point of departure. A lot of thematic material is shared between yours and the original, but it splinters off into different paths, what was your original vision? CM: My vision was (and is) a kind of 'translation', comparable to translating poetry, in other words conveying poems into another language: which is inevitably also the creation of a new or completely rewritten poem. First you absorb the original material, then you create something new from it. LJ: Did you re-arrange the music or use the scores as a blueprint? CM: The music is fundamentally changed rather than "re-arranged", but the original material is still audible, and is never completely hidden. LJ: Dowland didn't have crocodile tears? Where did that idea come from?! CM:In contrast to the original, I didn't want to stick exclusively to the mood of melancholy so there are tears which express other emotions: Tears of Joy, Tears of Love, Tears of a Clown or Crocodile Tears. LJ: How did you go by selecting the musicians/orchestration? CM: I wanted: (1) no percussion, in order to lay emphasis on the chamber music aspect. (2) a second wind-player with a similar sound to my trombone, (Matthieu Michel´s flugelhorn), to bring out the polyphony (3) a second harmony instrument alongside my piano which could also play both melodically and percussively (Franck Tortiller) and (4) .there had also been a long-standing friendship with Steve Swallow which has finally led to a project which we could do together . This band is a "Dream Team"! LJ: How was working with Steve Swallow for you? CM: A dream. I am so much looking forward to our tours with him. As a musician and as a friend he is a "saint" to me. With every note he plays Steve thinks about the totality. He creates space for everybody. LJ: The other musicians on the album are less familiar to us? Tell us about Franck and Mathieu? CM: I met both, Mathhieu and Franck, in the Vienna Art Orchestra in 1994. Since this time we have worked together in many different bands, projects and contexts. (Both are in my "Yodel Group", Franck also played in my Trio for years). Matthieu (a french-Swiss) is a master in harmonic improvisation and I am in love with his warm, centered sound. Franck (from Paris) plays the vibes as a full harmonic instrument (4 mallets), so you never miss harmonic richness, besides his virtuosity and timing. He leads several bands and also led the "Orchestre National de Jazz" for 3 years and composed several programmes for it. LJ: Is this project a one-off or will it lead you/ has it already led you into other renaissance music? Or where will it lead you next? LondonJazz: Finally, what other projects are you currently working on? Christian Muthspiel: Beside the Cello Concerto I will conduct several concerts this season (mainly New Music, but I just did, for example, Dvorak 9th Symphony in Germany), and next year I will tour again with this band and, as a conductor, with a great youth orchestra from South Africa. Fascinating interview - are there any links to tracks from the album or to performances by the quartet? Fantastic clips - it would be great to persuade Muthspiel and his group to play over here - these live clips show how engaging the works are in live performance.